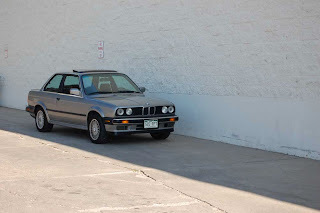 I would say the only downside of getting my race program up and running was having to sell my 1988 325IX. I need a four wheel drive truck that will double as winter commuter and tow vehicle. 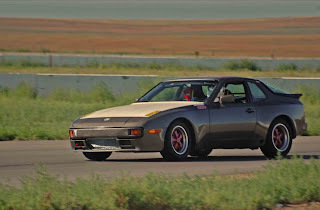 This 27 front 63 rear split all wheel drive machine was the best bad weather car you can imagine. And the rarity of a three year only production run in the US made it a rather unique sleigh for when I played Santa Claus. I drove Silver Spoons in only the nasty weather. Rain, snow, sleet. And it loved it. With all season Contis it was able to slice through the crustiest crust or slushiest slush. Nothing though is comparable to the feeling of passing SUVs in a 20 year old automobile that most people suspect is only RWD. If you ever have the need for a hearty winter car, I suggest you try to make an Ix, not an xi, a potential candidate and garage stable mate. I work as a creative director on the Miller Lite account. And we get to do lots of fun stuff. 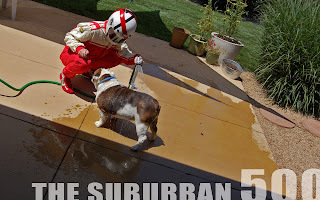 But none more fun for me than the annual NASCAR promotional work we do. I got to spend two days with Kurt in Charlotte shooting the car, him, some promotional stuff at Lowe's. He is a great guy, really laid back. And this year I got him to sign my clutch shoe. 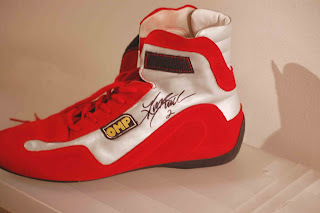 My left shoe that I picked up from OMP America. Here is a secret, the OMP America site has a fantastic sale section. New stuff at stupid low prices. I have to be careful not to go too often or I would buy too much. The stuff is worth the full asking price, a steal at the outlet prices. I got my suit, seats and steering wheel here. Let's hope some of Kurt's skills were transferred in the signing. 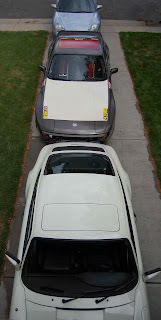 Here's a lame aerial of all three cars. But most of the work gets done on the one in the middle. With my brother in town I was able to get some brake work done on the SPEC car and Boxster. We flushed the Boxster's brake fluid. After three track days on the two-year old fluid it was well due. The pedal feel was probably 10% firmer. 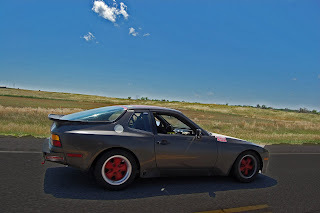 On the 944 SPEC after miserable brakes, I ordered some Hawk pads and ATE Super Blue. With both installed, the car now stops like a race car. What a difference. It must be on the order of a 50% increase in clamping power. I would have taken pictures of the above procedures but if you need help with them, or pictures from me, I suggest you take your car to a mechanic. Been a poke since I posted about food. Trust me, I am still trying to eat as well as possible, but that does not always mean high society style. 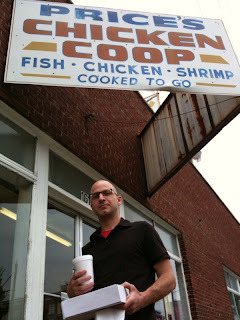 Case in point, Price's Chicken Coop in Charlotte. For $6 you get a breast, wing, two hush puppies, a grip of tater tots and some cole slaw. Packets of ketchup are $.05 extra. That's right, you have to pay five cents to get some ketchup. How awesome is that! No chairs inside. We ate outside, in a light mist, resting our boxes on top of the newspaper stands. The food was better and more honest than the meals we had at Blue or Zink, two of the supposedly best restaurants in Charlotte. Note, KFC is Nicolas Cage to Price's Elvis. A cheap imitation. 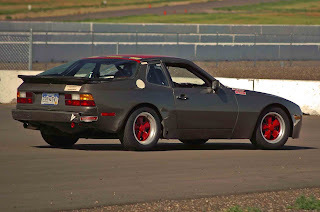 After six months of non-stop work I finally got my car on the track. 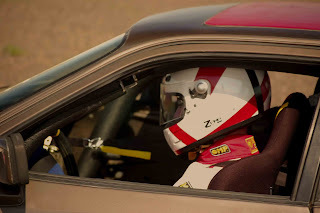 A rare weekend lapping day at HPR. It was fantastic. There was only 12 cars at the track. It was like having a private session. Great times. Since I built the car, I was a little leary about the build quality. So the first few laps were in the 2:38 range. Pretty slow and the car was really oversteering. Came in and adjusted the rear sway bar a half inch softer and went back out. What a difference. The car was pretty well balanced now and able to slowly build speed. Getting the times down to the around 2:25. Obviously lots more time needs to be spent adjusting shocks and tire pressure, but overall I was very pleased. It is such a fun easy car to drive except, the brakes. Wow, I have no idea what pads are on the car but they are not good. I flushed the brakes twice too. But man, after two laps they were softer then an undercooked flan. So, I ordered a set of Hawk pads and ATE Blue. 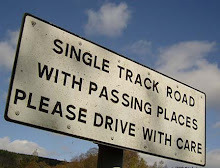 With decent brakes, chopping 5 seconds off a lap should be no problem at all. 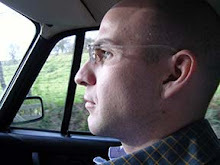 My friend Chris came with me and certainly pushed the car harder then idea. I guess he has more faith in my wrenching skills then I do. This 1963 limited production coupe I think has lots of Boxster cues. 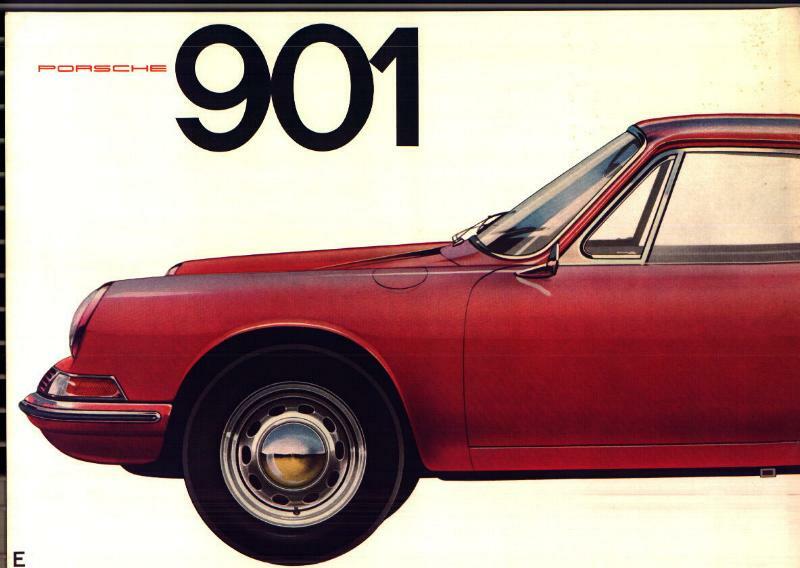 The sloping hood, The slightly raised fenders. Check out the vents in front of the rear wheels. Very Boxster. Even the large middle vent in front. As they say, there are no new ideas. 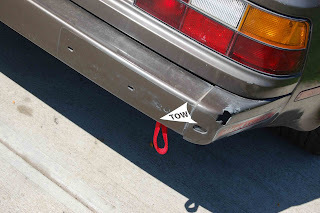 It's gonna be a bad day if you need to use your tow hooks. It means you can't return to the pits under your own power. So, if you need them, might as well make them as light as possible. And inexpensive. Many of the common steel ones go for $40 a piece. I was then pleased to find these lightweight tow straps from Safequip. $40 for the pair, and super lightweight. 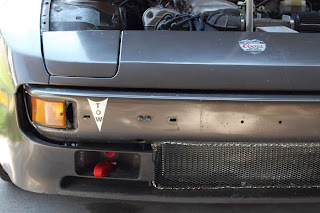 The front one is bolted to the chassis and threaded through the driving light opening. 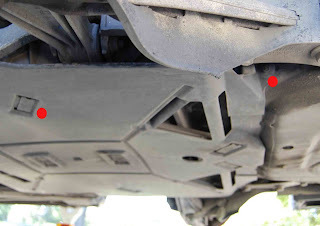 The rear is connected to the bumper shock mount. Nice and tidy. The other benefit of straps over steal is that if you do bump while racing, no damage can happen to the bumper's or the bumpee's cars. OPRV Leak Fixed. My Pressure is Lowered. This was one doleful, miserable, dirty-as-a-nightsoil collector job. I should have been able to just replace the $.23 crush washer. 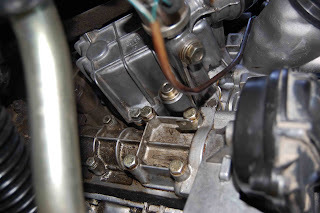 But the PO, as all Porsche owners know is super dangerous, stripped the threads and super tightened the OPRV. The result is that I had to replace the cooler housing and all associated gaskets. I followed the Clark's garage procedure. With just a couple of modifications. First, I did not loosen the exhaust manifold. Maybe I have small hands but I was able to get to the bolts I needed to easily. The second thing that I did differently was that I put the gasket on the assembled cooler and housing, not on the engine block. It was much easier to tack the gasket to the housing with some Loctite 574. This allowed me to be sure that the gasket was aligned. And regarding the alignment tool. I asked to borrow my mechanic's tool and he said they never had one. Never needed it. Replaced over 100 of them in 944s and saw no need. I had no problem doing without. It fired up and worked fine. The joy of owning a car that for now is not leaking is off the scale. I have a few more vignettes to go. And many more opportunities to prove to my neighbors I'm not stable. But seriously, don't a lot of us feel like all we are doing is 'racing' around in our daily lives. This just shows how ridiculous we look and are. Take time to slow down. 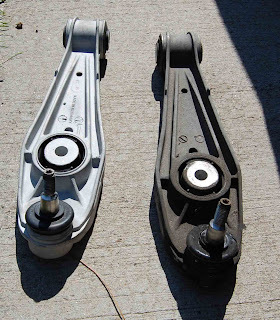 My Boxster's front suspension was creaking more than Bernie Kosar's knees. 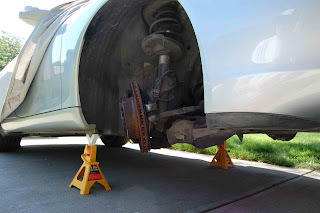 And when it started shaking under heavy braking like it had warped discs I knew it was time to replace the control arms. 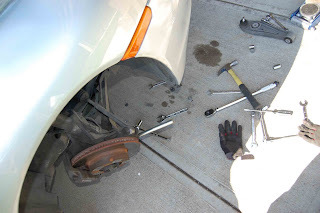 First, jack up the car, remove the wheels and turn the wheel to full lock. You will have to turn it the other way to replace the opposite side. The procedure is the same on either side. Next, remove the clip and plastic nut next to red dots so that you have enough room insert your wrenches. In the next pic, you can see the 16 and 18mm wrenches in place. Take the nut off but leave the bolt in place. Next, remove the nut but leave the bolt in place for the track arm. Now, you can get a fancy Porsche ball joint popper but since you are not reusing the ball joints you can use the old fashioned hit it hard popper. Two whacks and the ball joint popped out as easily as snapping a pain killer pill from a blister pack. Then, take out the bolt holding the track arm. Then, the bolt holding the arm to the chassis. The arm will come out easily. 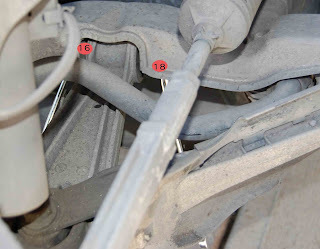 To install, start by the chassis and slide in the bolt and catch the nut, do not tighten until all is in place. Then, install the track arm bolt and nut. 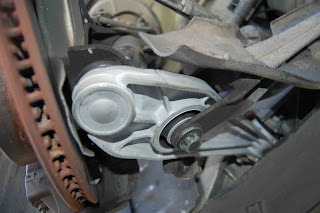 And finally, get a small jack and force, it does not take much at all, the ball joint into the strut housing and tighten. Now go through and torque all the nuts. Good luck getting a torque wrench on the ball joint, so, just nice and tight. No need to kill it. 110ftlbs on the track arm bolt and 70 something ftlbs on the chassis bolt. You can see the finished product. Visually, the old arm looks fine but the ball joint was shot. Loose, torn boot, etc. I went with rebuilt units from vertexauto.com for $189. Each. It took me an hour and half working pretty slowly, No need for alignment after this either. It is so easy you are crazy to pay a shop $200 + to install them for you.